684 North becomes NY 22 North in Brewster, NY. Follow 22 North for 18 miles. Just past the Harlem Valley train station, bear right onto NY 55. Go .94 miles. Turn right to follow NY 55. Go .93 miles. Take first left onto County Hwy 22/Dog Tail Corners Rd. Go through old Webatuck Craft Village and keep right to follow winding Dog Tail Corners Rd. Go 1.46 miles. Turn right at next crossroads to continue on Dog Tail Corners Rd. Go .58 miles. Dog Tail Corners Rd. becomes Bulls Bridge Rd. as you cross into CT. Continue .81 miles. Go over covered bridge and turn left onto US 7 North/Kent Rd. at light. Go 3.76 miles. 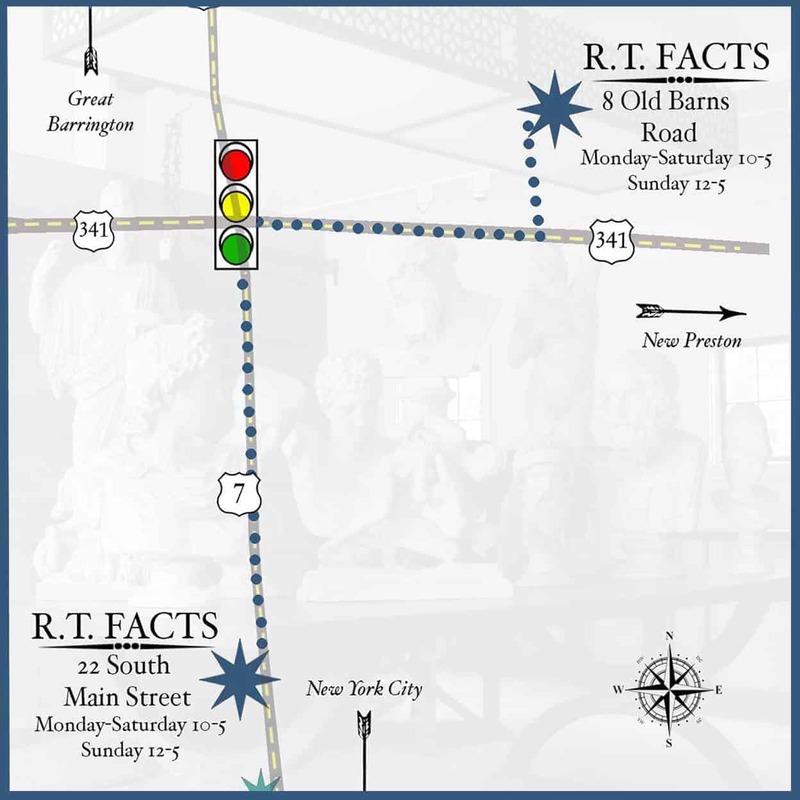 RT Facts will be on the left as you approach town, just past Kent Greenhouse and across from the Kent Art Association. To reach RT Facts Gallery turn right at the light. The gallery is on your left in the Kent Barns complex. Do NOT turn left onto Dog Tail Corners Rd. (covered bridge cannot accommodate trucks). Continue on Rt. 55 until it ends at intersection with Rt. 7 in Gaylordsville, CT. Turn left onto Rt. 7 North, crossing over river. Follow Rt. 7 for 6.4 miles to RT Facts on your left. See above directions for landmarks. Take exit 39 towards Farmington/CT 4. Go 1.07 miles. Stay straight onto CT 4/Farmington Ave. Go 4.87 miles. Turn slight right to follow CT 4. Go 2.81 miles. Turn left to follow CT 4. Go 8.12 miles. Stay straight onto CT 118. Go 7.42 miles. Turn left onto US 202 West in Litchfield. Go 7.34 miles. Turn right onto CT 341 at bottom of long hill. Go 13.17 miles. Gallery is on the right in the Kent Barns complex just past firehouse. To reach RT Facts shop turn left at the light onto US 7 South. Shop is .1 miles on the right. Turn onto County Hwy 105/Sinpatch Rd. Go 1.2 miles. Turn right onto County Hwy 3/Bog Hollow Rd. Go 3.19 miles. Bog Hollow Rd. becomes CT 341 crossing onto CT. Go 2.79 miles. Turn right onto South Main St./US 7 South. RT Facts shop is .1 miles on the right. To reach RT Facts Gallery, continue straight through light on 341. Gallery is in Kent Barns complex on your left.